Martin O'Neill: confident he can turn things around for Euro qualifiers. MARTIN O’NEILL REPORTEDLY held discussions with the FAI about his future yesterday. 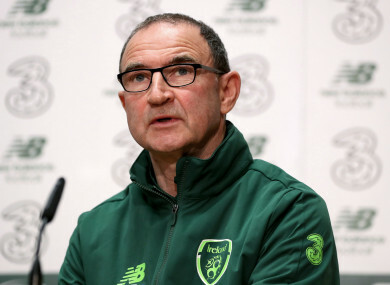 The Republic of Ireland boss was summoned to late-night talks at an English hotel with Association chiefs, according to The Telegraph’s Luke Edwards. FAI boss John Delaney is said to be alarmed by the poor attendance at last week’s international friendly with Northern Ireland at the Aviva Stadium as well as the team’s poor recent performances and he’s been persuaded to make a change to the management ticket. Ireland wrapped up a torrid year, in which they won just once, with a scoreless draw away to Denmark on Monday night. Afterwards, O’Neill insisted his enthusiasm for the job had not waned and he was looking forward to the Euro 2020 campaign. Email “Martin O'Neill summoned to crunch talks as FAI eye change - reports ”. Feedback on “Martin O'Neill summoned to crunch talks as FAI eye change - reports ”.